This Help Desk article describes the various sections and field titles that are part of our Link in Profile plugin page template. Click here to learn about how to install and apply this plugin to a page template on your WordPress site. The first section of the Link in Profile page is the Page Settings box. This section controls some of the general settings for your page, including the colors of each major heading section. Hide Page Title → Hides the name of the page, which you named with the instructions above. A great feature if you don’t want the page title interfering with any part of your latest post or menu buttons! Heading Background Color → Refers to the sections of color set behind the “Featured Content” and “Links” section titles. For an example, check out our Link in Profile page here (best viewed on a mobile device). The section of pink behind the “Explore More” heading above the buttons is an example of a heading background color. Heading Text Color → Controls the color of the heading text in the “Featured Content” and “Links” sections. Button Background Color → Controls the background color of the buttons used in the “Featured Content” and “Links” sections. Button Text Color → Controls the color of the text in each button within the “Featured Content” and “Links” sections. When enabled, this section feeds in content from your blog, at the top of the page, automatically! You can use the settings to control which post appears here. Hide Section → This setting hides the section completely, in the event you don’t want to feed in post content (and instead, want to lead with the “Links” button section). See an example of this here (best viewed on a mobile device). Section Title → Creates a small title, which will appear above the post when this section is enabled. A great example title might be “New on the blog:” or “Latest Post.” If you are using a section title, you may find it useful to turn on hide the page title, as described in the Page Settings section, above. Choose a Post to Feature → This setting controls which post will appear at the top of the page. You can check Always show latest post to automatically feed in the most recently published post in this space. Or, use the dropdown buttons to create other unique settings! The first dropdown, Select a Specific Post, allows you to pull any post from your archives. This is great for featuring an old post—perhaps one that you just referred to in Instagram Stories, or via an Instagram post. 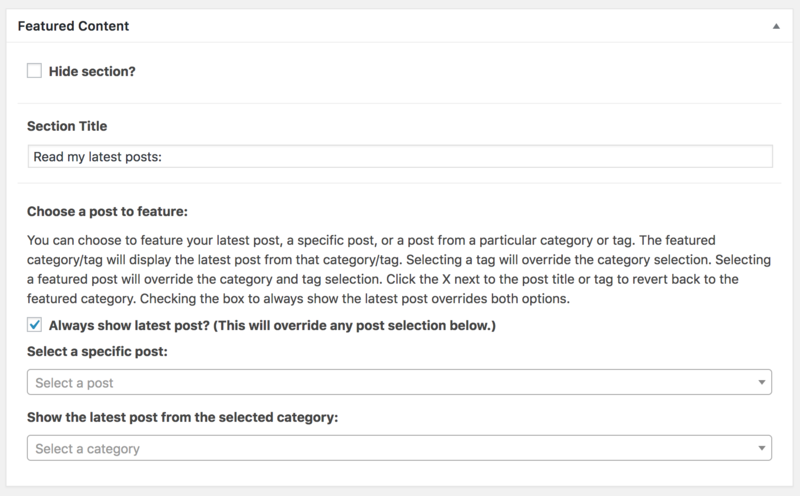 If you want to always highlight a particular category, you can choose to feature a post from a selected category, or a selected tag. When enabled, this section creates large menu buttons that are completely customizable, allowing you to link to any URL you wish. You can create up to eight different buttons! Hide Section → This setting hides the section completely. Section Title → Creates a small title, which will appear above the list of buttons when this section is enabled. A great example title might be “Explore More” or “Don’t Miss.” You want to integrate a title that simply and succinctly introduces the list of buttons below! Link → For each Link Text field, provide a corresponding link to the right of it, to get users to the correct place! Simply copy and paste your link in. When enabled, this section allows you to feature rewardStyle, LiketoKnow.it, or ShopStyle widgets. There are also spots for up to six thumbnail images, with short captions beneath, making this a perfect place to feature products or create image-based buttons. For an example of how you can use this section to create a secondary menu of buttons, check out the <em>press Link in Profile page, here (best viewed on a mobile device). Section Title → Creates a small title, which will appear above the list of buttons when this section is enabled. 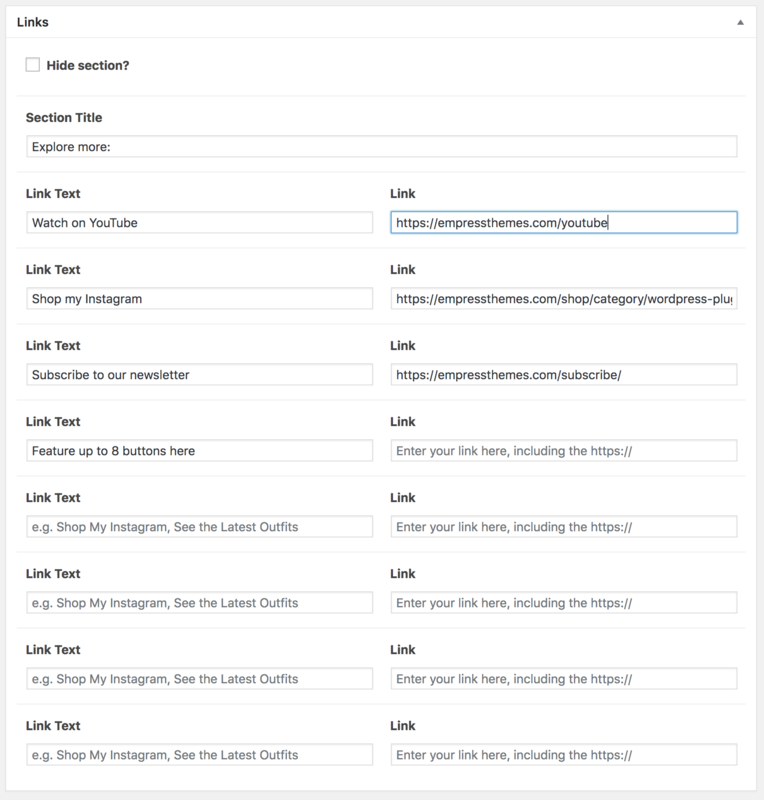 A great example title might be “As seen in Stories” or “More Favorites” or “Explore More.” We recommend titling this section based on the content you are featuring below—whether that’s more of your post content, external social media platforms, or shoppable products. Shop the Post Widget → For rewardStyle and ShopStyle users, you can embed a shoppable widget in this section. rewardStyle users: use a Shop the Post widget. You can experiment with the product image size as you build the widget to change the look and size of each displayed product. 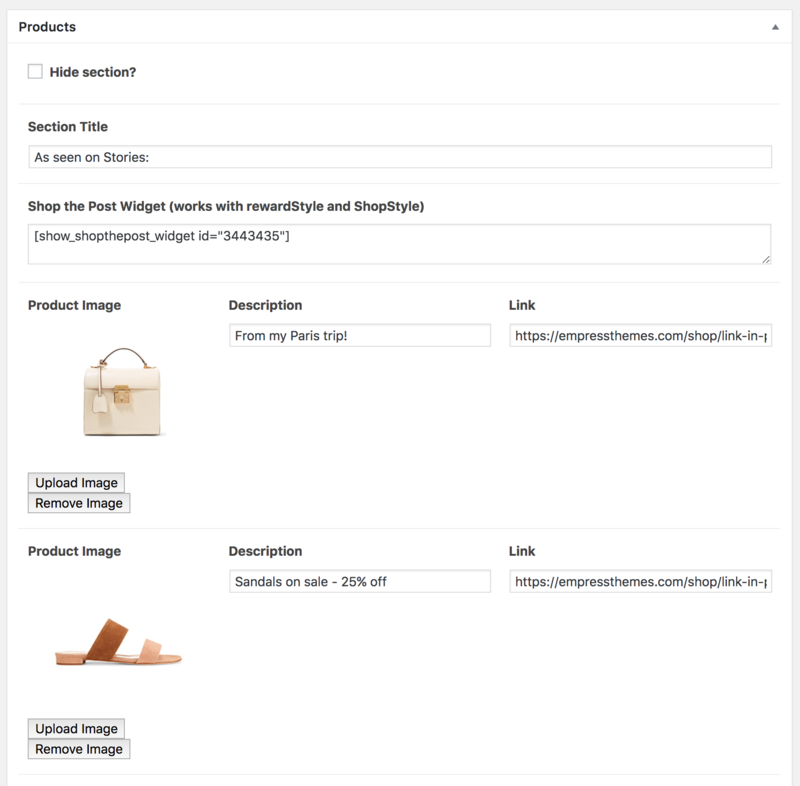 ShopStyle users: use a Product widget, building it with 1 row and 2 or 3 columns. Product Image → Click the Upload Image button to upload the thumbnail of your choice to this section. For optimal image sizing, size images at least 355px in width. While images can be any height, they will look best if images in the same row have the same pixel height! Description → This field corresponds to the small caption below each image. To see an example, check out the bottom of the press Link in Profile page, here. Link → Use this field to provide the link of where the image and caption should link to once tapped. What is Link in Profile? Why is the Classic Editor plugin required with Link in Profile? My Link in Profile fields aren’t loading in the editor.